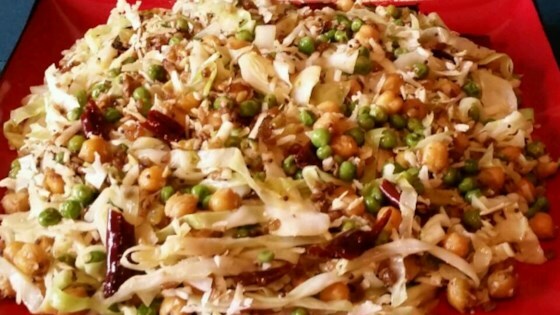 "This a very simple yet delicious Andhra recipe for cabbage koora (sabji). I like it so much that sometimes I eat it all by itself, like a salad with some yoghurt on the side. The spice here comes from the green chilis. Serve with rice." Heat the oil in a large skillet over medium-high heat; fry the red chile peppers, urad dal, chana dal, and mustard seed in the hot oil. When the urad dal begins to brown, add the curry leaves and asafoetida powder; stir. Add the green chile peppers and continue cooking 1 minute more. Stir the cabbage and peas into the mixture; season with salt; cook and stir until the cabbage begins to wilt, but remains somewhat crunchy, about 10 minutes. Toss the coconut into the mixture and cook for 2 minutes more. Serve immediately. This is a good recipe for cabbage. I had cabbage to use up and this recipe caught my eyes. I didn't have chana dal and peas, so omitted them, but used onion. Delicious and easy to make too.